For the past three months I have been following the Carb Sensitivity Program developed by Dr. Natasha Turner. The intention of the program is to help your body reset its relationship with carbs so that you can enjoy them without watching your waistline swell. The program is also an eye opener in regards to which foods your body digests with ease and which ones it doesn’t handle so easily. Though the book does come with some great recipes, after a while I got bored and started to branch beyond its pages. This was also around the same time that I finally jumped on the pinterest bandwagon so I thank the pinterest world for hooking me up with some great stuff (If you’re interested in what I found feel free to follow my pins). There are a few gems though that I can proudly say I came up with on my own and this one has gotten such positive reviews that I thought I would share. 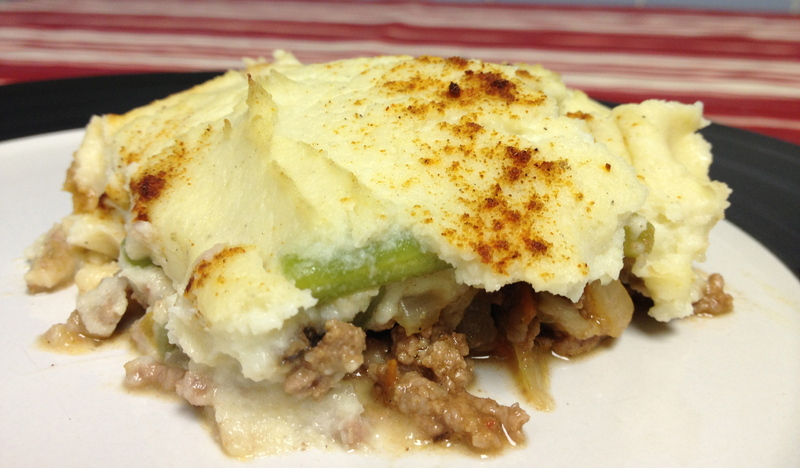 It is a carb-free shepherd’s pie that is just as hearty and satisfying as the real deal. Some have even claimed it to be better! I’ll let you be the judge of that yourself though. Chop the cauliflower, onion and garlic and steam until cauliflower is tender. Remove from heat and place in a food processor with olive oil, salt and pepper. If desired you may add additional spices for seasoning. Purée cauliflower mixture until creamy. If you would like a smoother consistency just add more olive oil. Let cool while you are preparing the filling. In a large saucepan heat olive oil and sauté onions. Once onions are cooked add the ground meat and brown. Remove the cooked meat from the pot, discard any excess liquid and set meat to the side. Cook the green beans and mushrooms on medium heat in the same pot the meat was cooked in. Once vegetables are almost completely cooked add the meat back into the pot along with the tomato sauce, salt and pepper and let cook for another 5 minutes, or until vegetables are tender. On the bottom of a large baking dish evenly spread the meat and vegetable filling. Top the filling with the whipped cauliflower and distribute evenly. If desired you may also sprinkle the top of the pie with paprika. Bake until pie is heated through. Approximately 20 minutes.